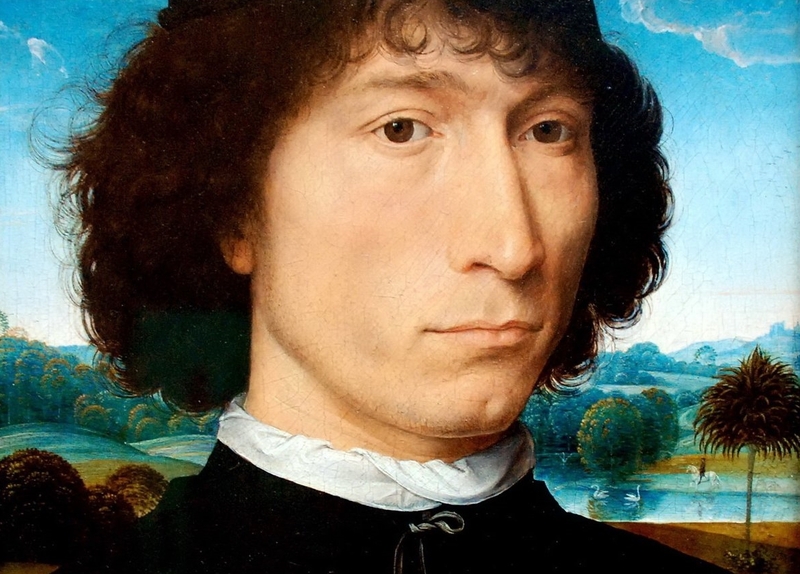 Hans Memling, Memling also spelled Memlinc, (born c. 1430-40, Seligenstadt, near Frankfurt am Main [Germany] - died August 11, 1494, Bruges [Belgium]), leading South Netherlandish painter of the Bruges school during the period of the city’s political and commercial decline. 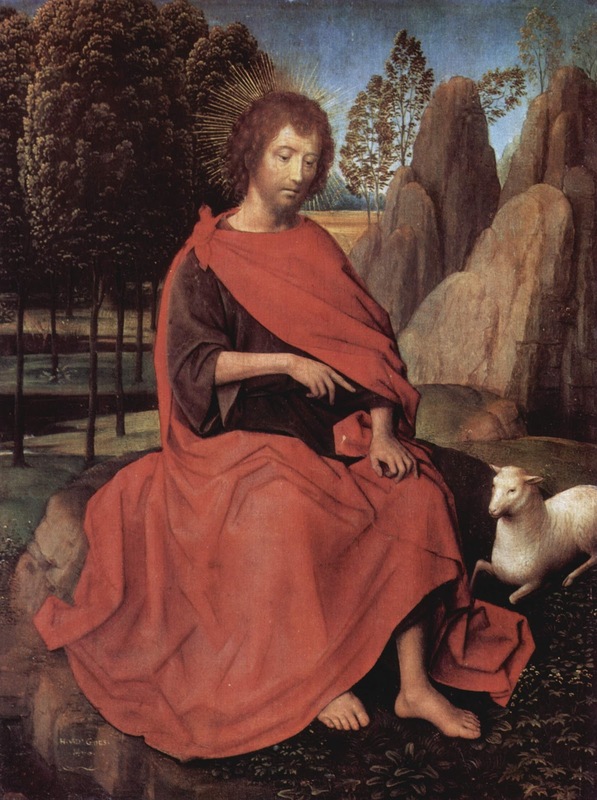 The number of his imitators and followers testifies to his popularity throughout Flanders. 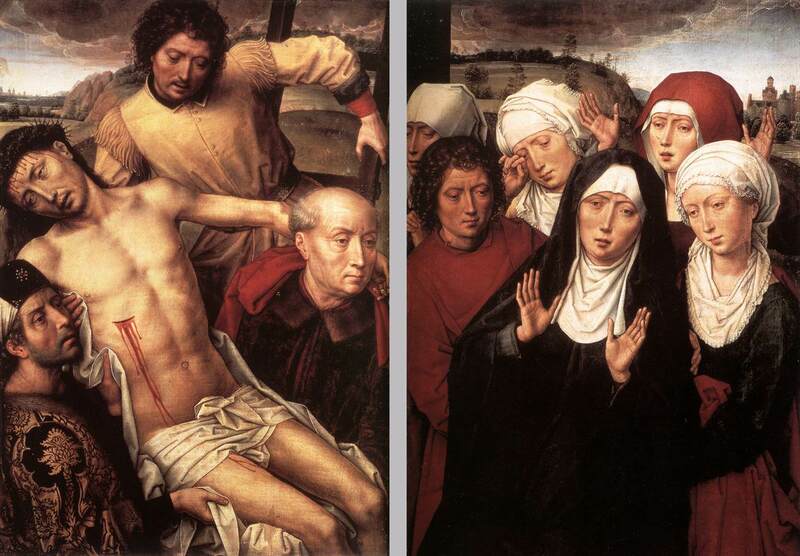 His last commission, which has been widely copied, is a Crucifixion panel from the Passion triptych (1491). 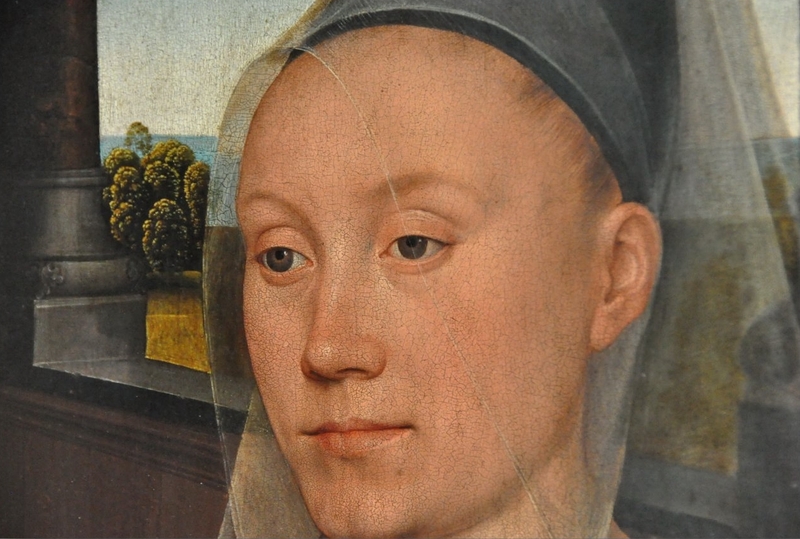 Memling, born in the region of the Middle Rhine, was apparently first schooled in the art of Cologne and then traveled to the Netherlands (c. 1455-60), where he probably trained in the workshop of the painter Rogier van der Weyden. 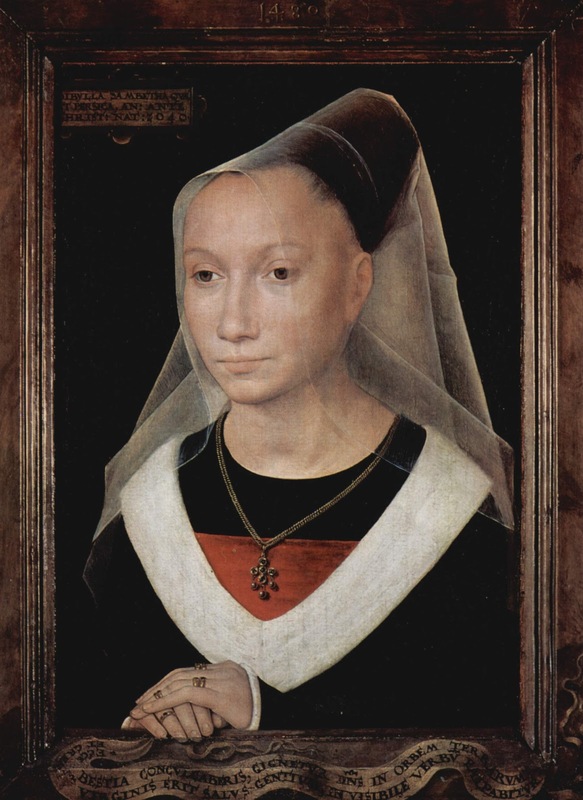 He settled in Bruges (Brugge) in 1465; there he established a large shop and executed numerous altarpieces and portraits. 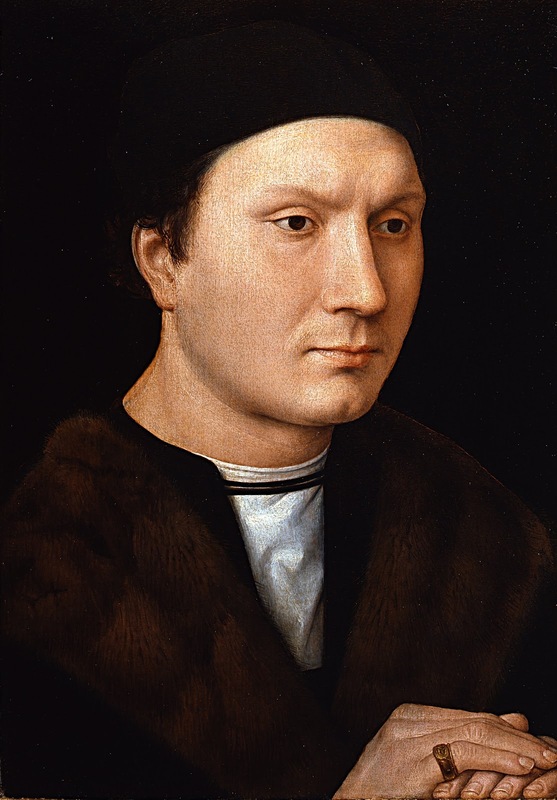 Indeed, he was very successful in Bruges: it is known that he owned a large stone house and by 1480 was listed among the wealthiest citizens on the city tax accounts. 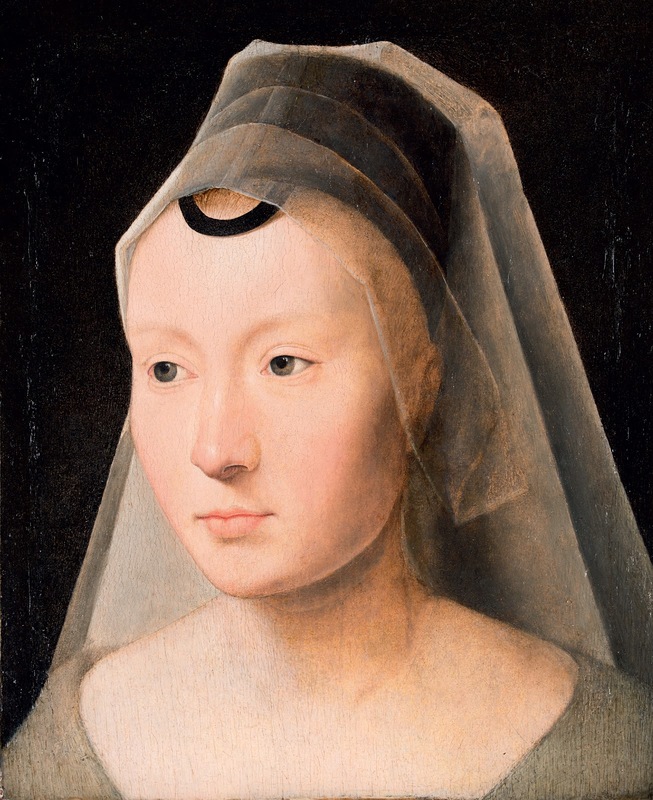 Sometime between 1470-1480 Memling married Anna de Valkenaere (died 1487), with whom he had three children. 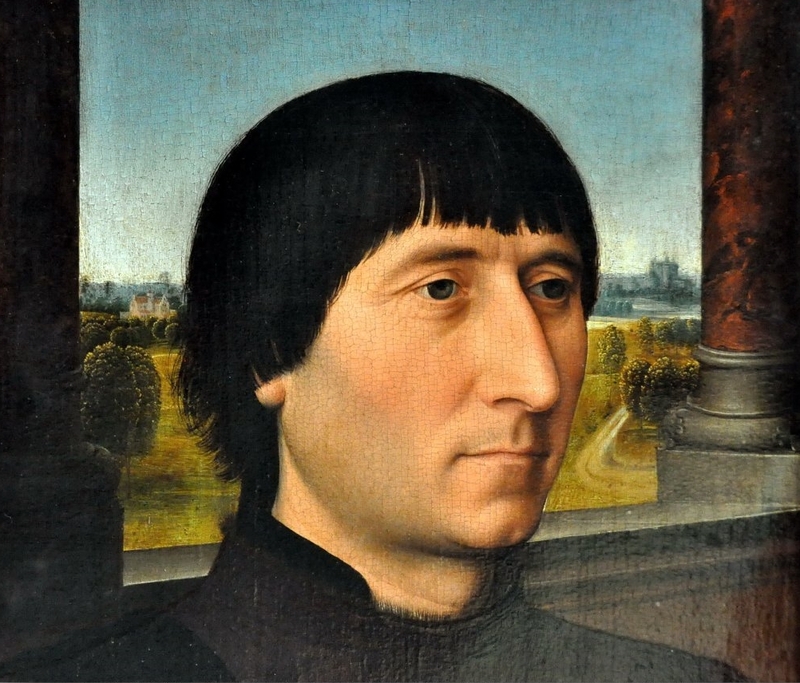 A number of Memling’s works are signed and dated, and still others allow art historians to place them easily into a chronology on the basis of the patron depicted in them. Otherwise it is very difficult to discern an early, middle, and late style for the artist. His compositions and types, once established, were repeated again and again with few indications of any formal development. His Madonnas gradually become slenderer and more ethereal and self-conscious, and a greater use of Italian motifs such as putti, garlands, and sculptural detail for the settings marks the later works. 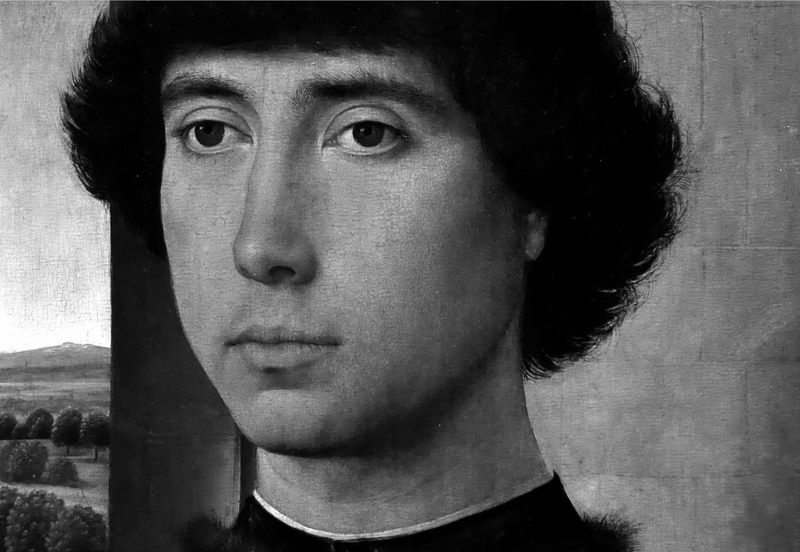 His portraits, too, appear to develop from a type with a simple neutral background to those enhanced with a loggia or window view of a landscape, but these, too, may have been less a stylistic development than an adaptation of his compositions to suit the tastes of his patrons. 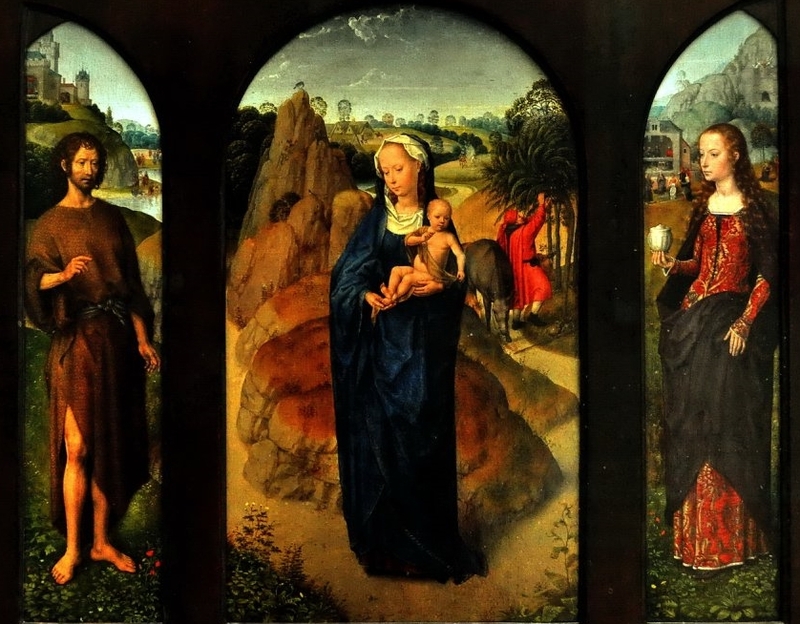 A good example of the difficulties of dating encountered by scholars is that for the triptych of The Virgin and Child with Saints and Donors (sometimes called the Donne Triptych because Memling’s patron was Sir John Donne). 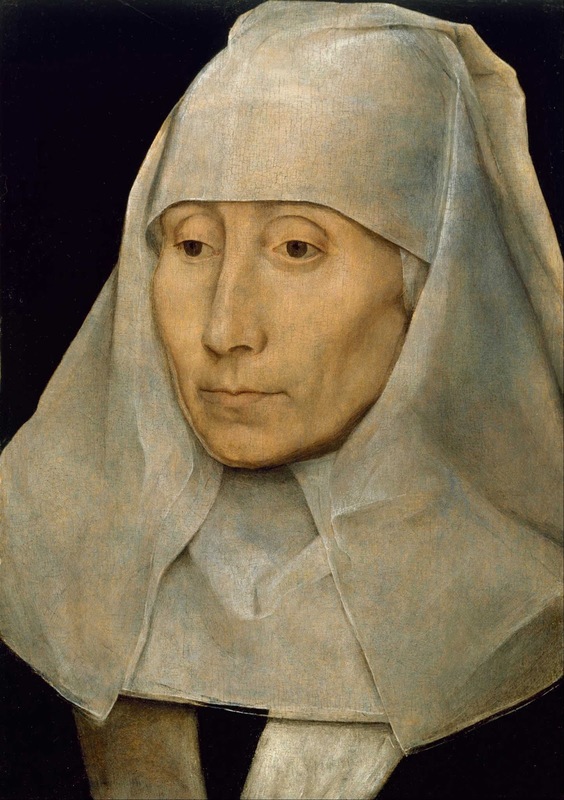 Once dated very early -about 1468- because it was believed that the patron commissioned the work while visiting Bruges for the wedding of Charles the Bold (duke of Burgundy) to Margaret of York and that he died the following year (1469) in the Battle of Edgecote. 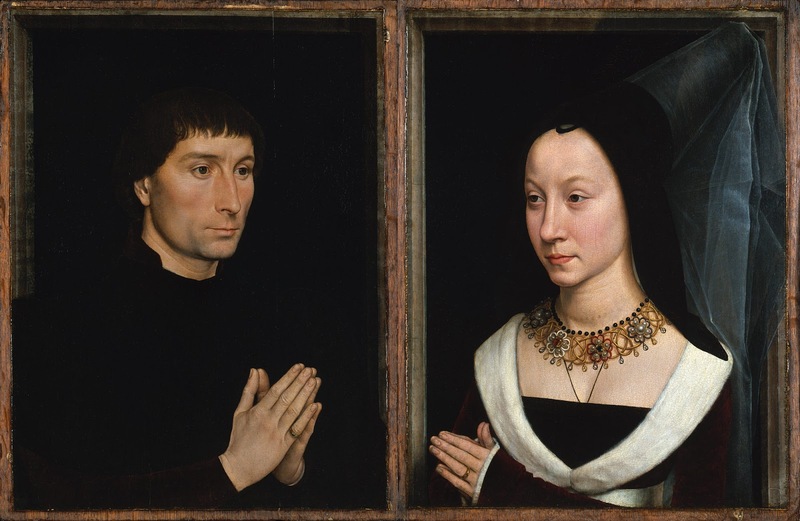 It is now known that Sir John lived until 1503 and that it is probably his daughter Anne (born 1470 or later) who is portrayed as the young girl kneeling with her parents in the central panel, thus indicating that the painting was commissioned about 1475. 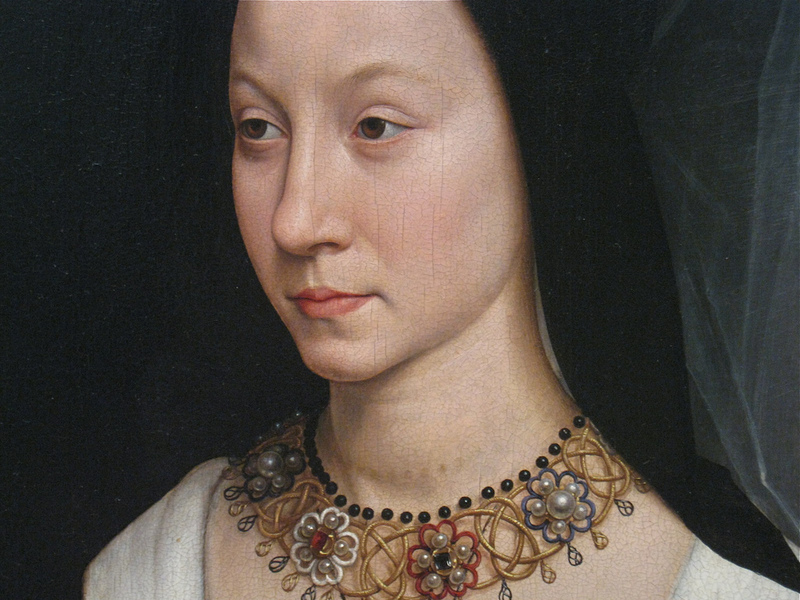 Memling’s art clearly reveals the influence of his contemporaries. 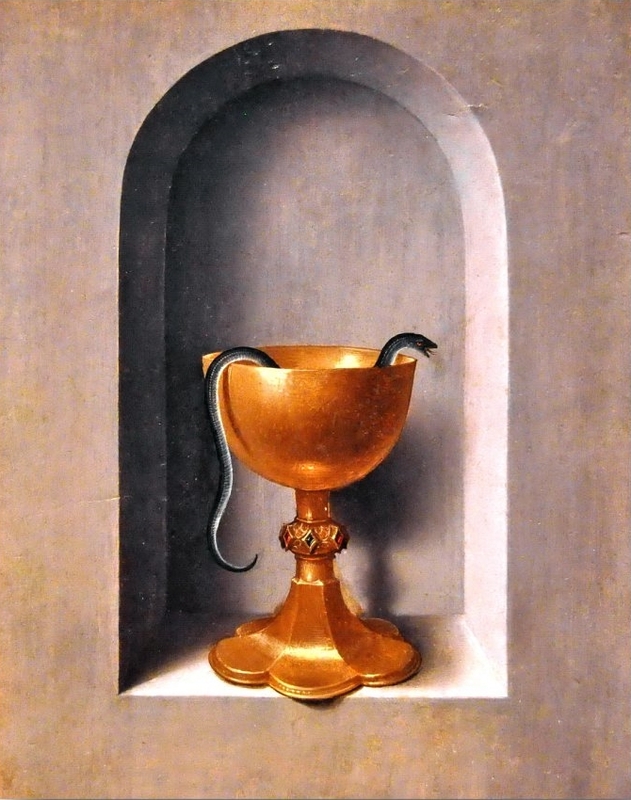 He borrowed, for example, from the compositions of Jan van Eyck, the famed founder of the Bruges school. 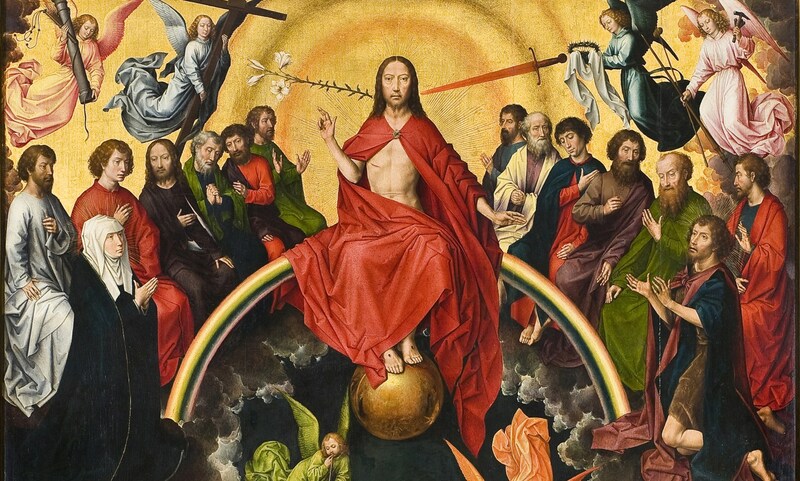 The influence of Dieric Bouts and Hugo van der Goes can also be discerned in his works - for example, in a number of eye-catching details such as glistening mirrors, tile floors, canopied beds, exotic hangings, and brocaded robes. 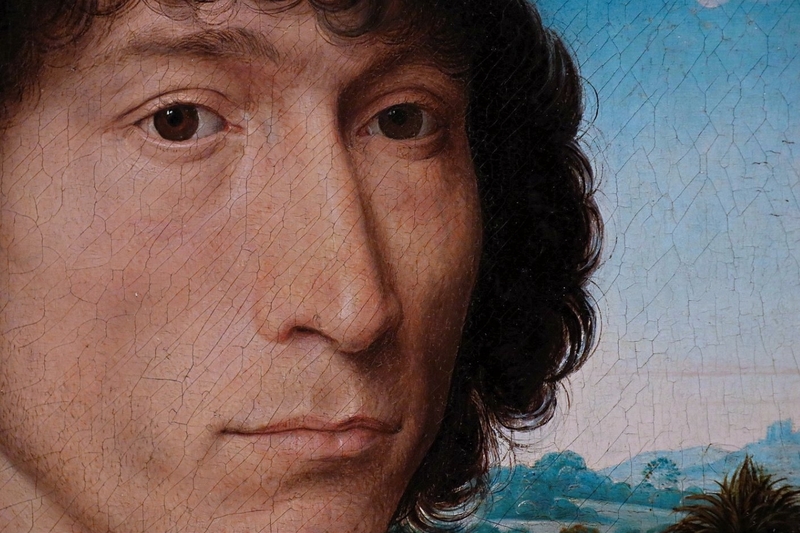 Above all, Memling’s art reveals a thorough knowledge of, and dependence on, compositions and figure types created by Rogier van der Weyden. 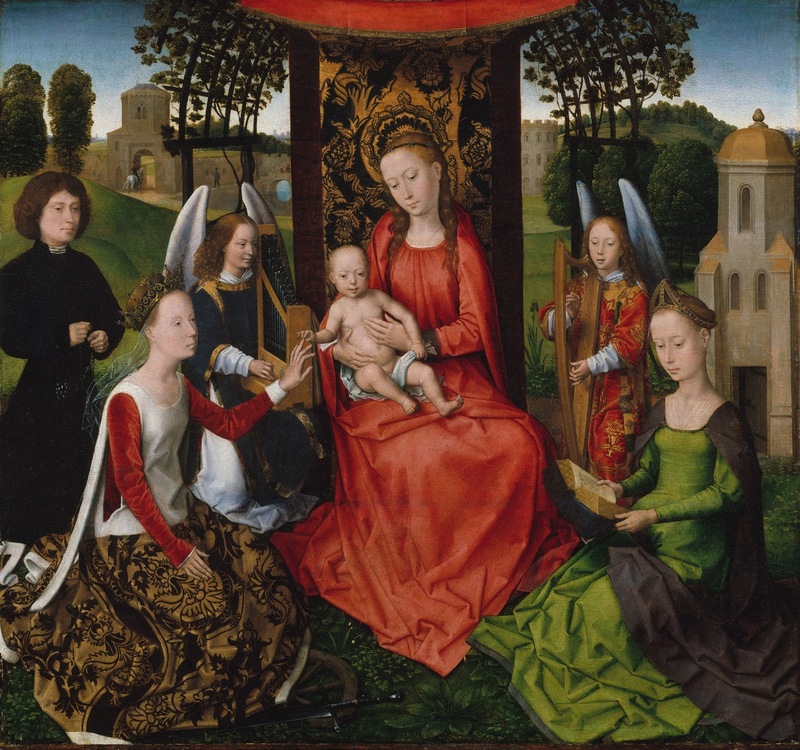 In Memling’s large triptych (a painting in three panels, generally hinged together) of the Adoration of the Magi, one of his earliest works, and in the altarpiece of 1479 for Jan Floreins, the influence of Rogier’s last masterpiece, the Columba Altarpiece (1460-64), is especially noticeable. 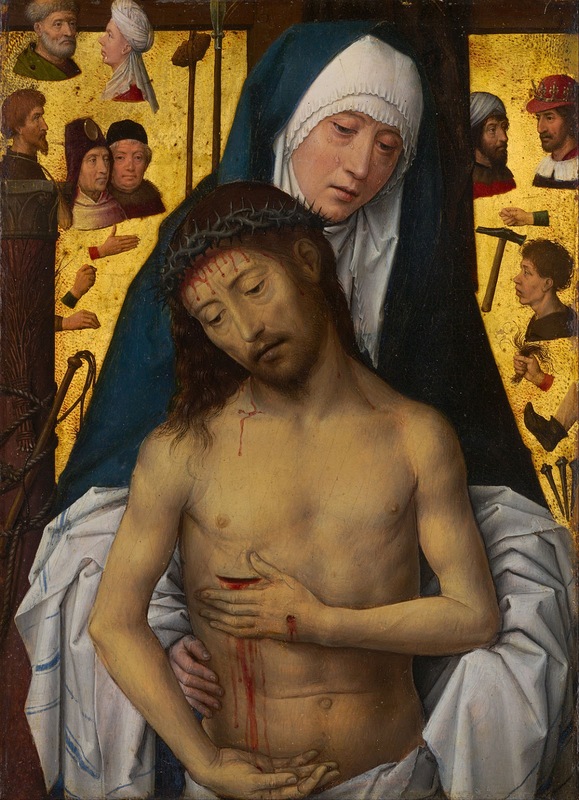 Some scholars believe that Memling himself may have had a hand in the production of this late work while still in Rogier’s studio. 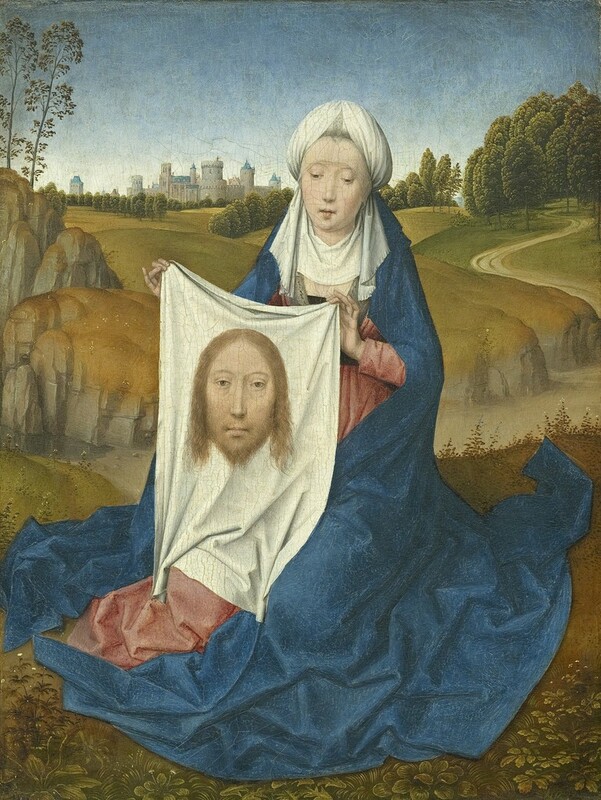 He also imitated Rogier’s compositions in numerous representations of the half-length Madonna and Child, often including a pendant with the donor’s portrait (as in the Madonna and Martin van Nieuwenhove). 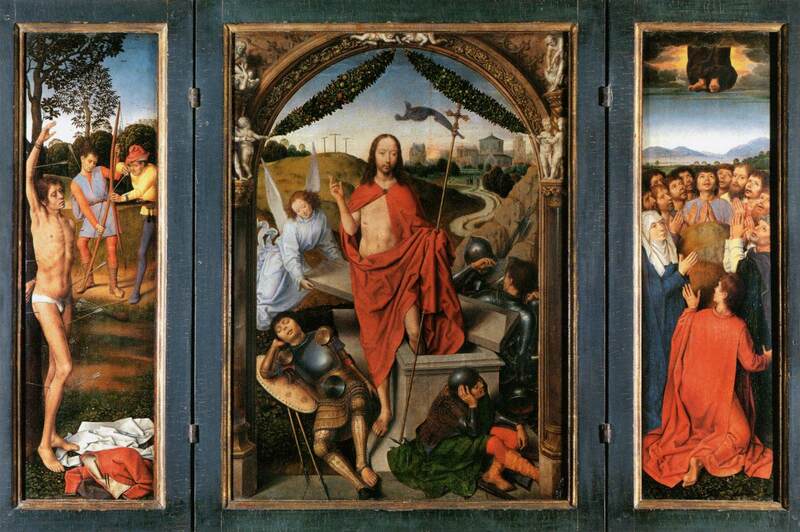 Many devotional diptychs (two-panel paintings) such as this were painted in 15th-century Flanders. They consist of a portrait of the “donor” - or patron - in one panel, reverently gazing at the Madonna and Child in the other. Such paintings were for the donor’s personal use in his home or travels. 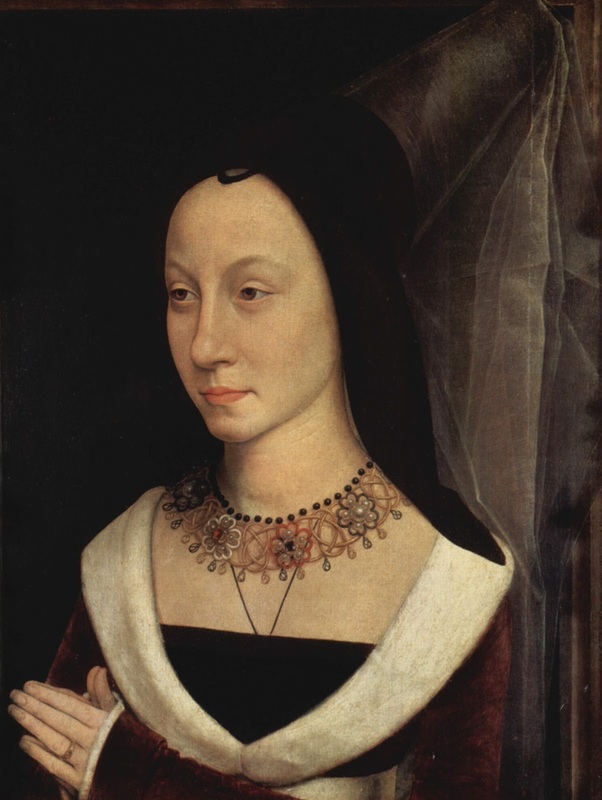 Most of Memling’s patrons were those associated with religious houses, such as the Hospital of St. John in Bruges, and wealthy businessmen, including burghers of Bruges and foreign representatives of the Florentine Medicis and the Hanseatic League (an association of German merchants dealing abroad). 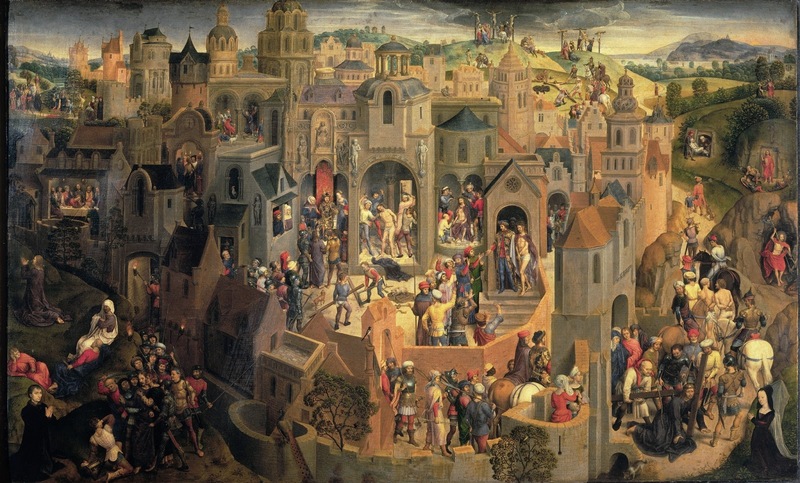 For Tommaso Portinari, an agent of the Medici family, and his wife, Memling painted portraits and an unusual altarpiece that depicts more than 22 scenes from the Passion of Christ scattered in miniature in a panoramic landscape encompassing a view of Jerusalem. 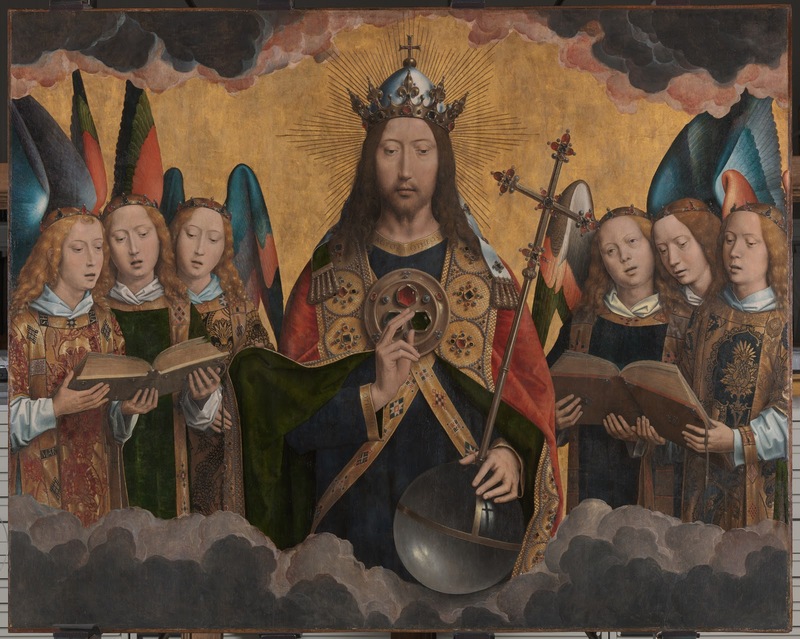 Such an altarpiece, perhaps created for new devotional practices, became very popular at the end of the 15th century. 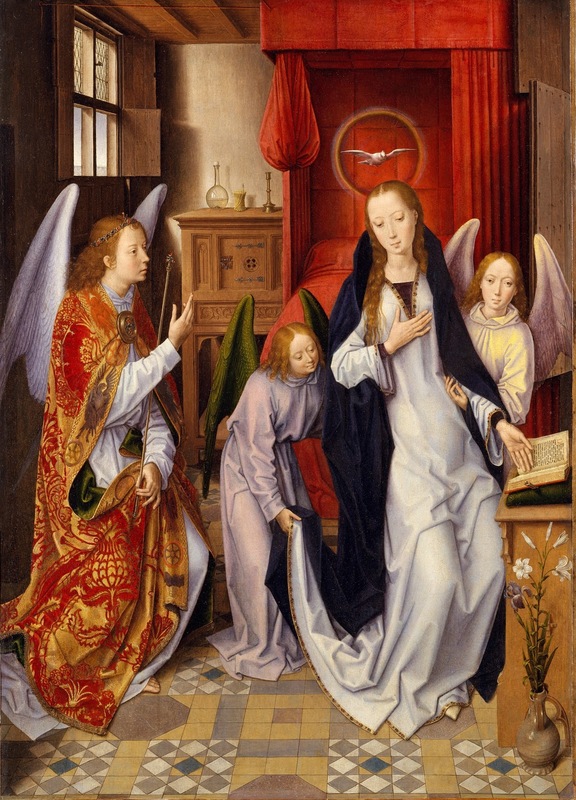 His best known work with extensive narration is the sumptuous Shrine of St. Ursula in the Hospital of St. John. 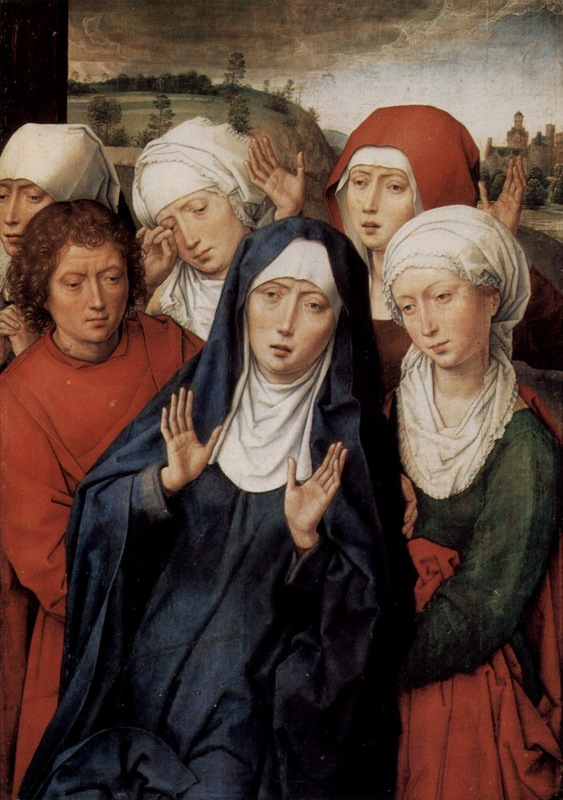 It was commissioned by two nuns, Jacosa van Dudzeele and Anna van den Moortele, who are portrayed at one end of the composition kneeling before Mary. This reliquary, completed in 1489, is in the form of a diminutive chapel with six painted panels filling the areas along the sides where stained glass would ordinarily be placed. The narrative, which is the story of Ursula and her 11,000 virgins and their trip from Cologne to Rome and back, unfolds with charm and colourful detail but with little drama or emotion. 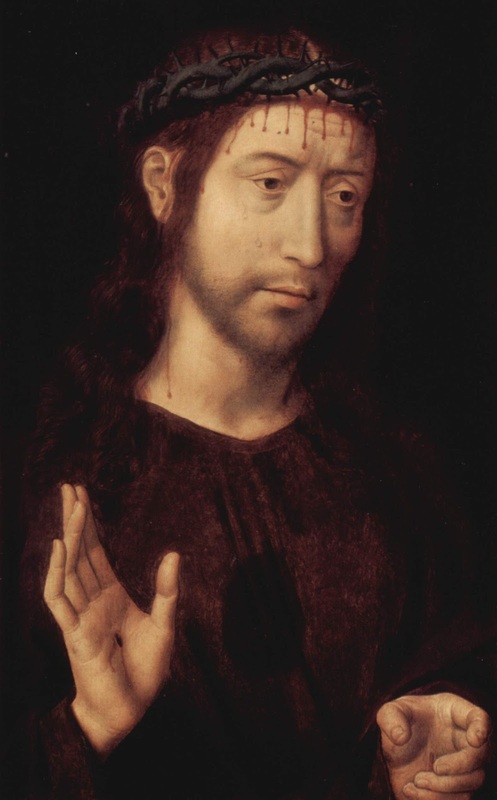 Other patrons of the same hospital commissioned Memling to paint a large altarpiece of St. John with the mystical marriage of St. Catherine to Christ as the central theme. 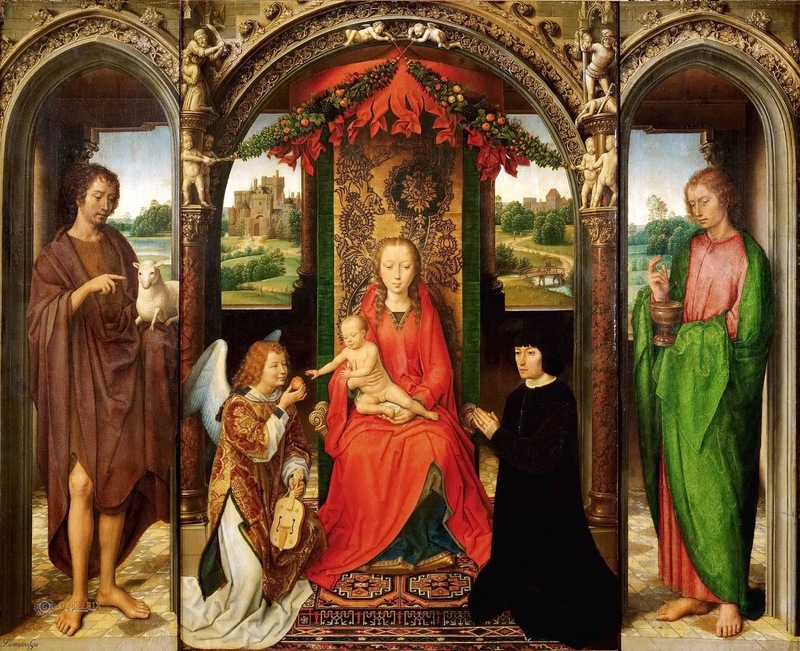 Elaborate narratives appear behind the patron saints John the Baptist and John the Evangelist painted on the side panels, while the central piece is an impressive elaboration of the enthroned Madonna between angels and saints (including Catherine) that one finds in innumerable other devotional pieces attributed to Memling. 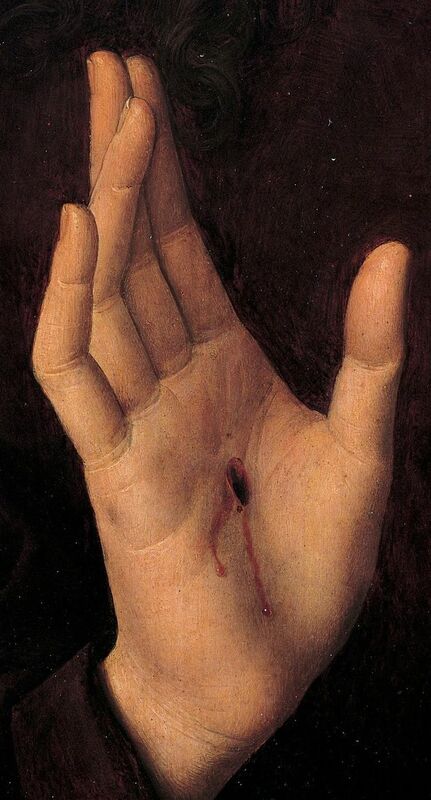 Memling was much acclaimed in his own lifetime. Recording his death, the notary of Bruges described him as “the most skillful painter in the whole of Christendom”. 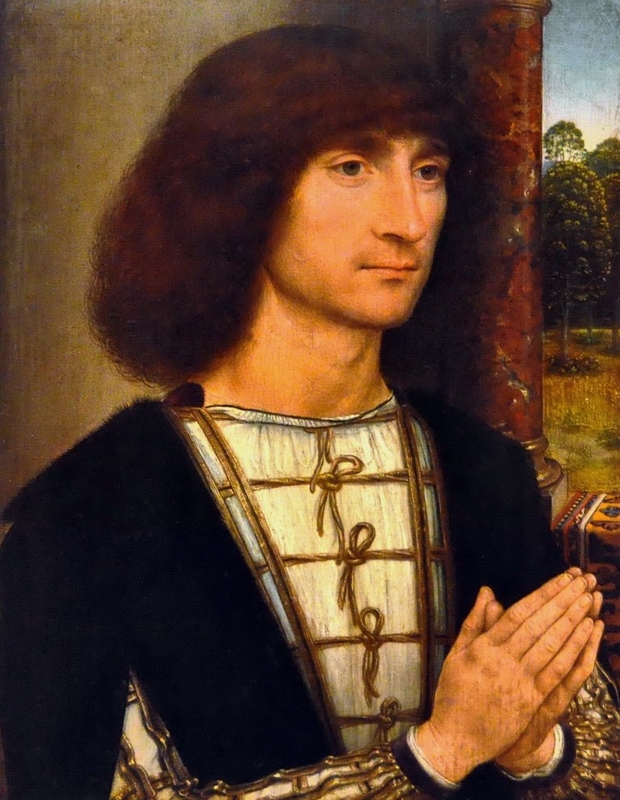 Yet because Memling’s work was so strongly influenced by that of other painters, it often was harshly dealt with by mid-20th-century critics. Since that time, however, his reputation has continued to rise. 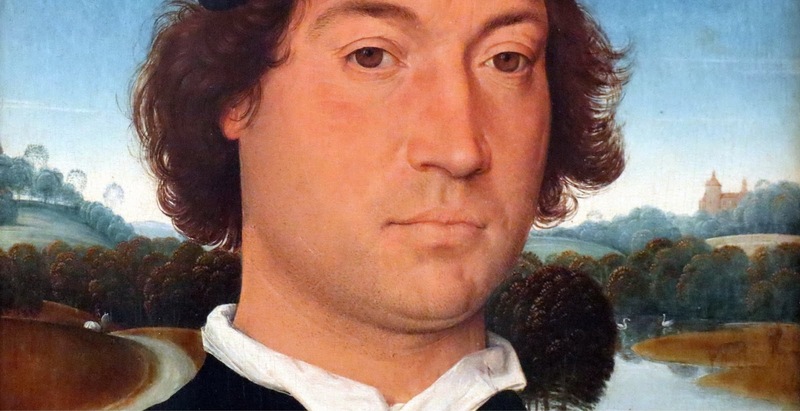 He is considered a major northern Renaissance artist**. 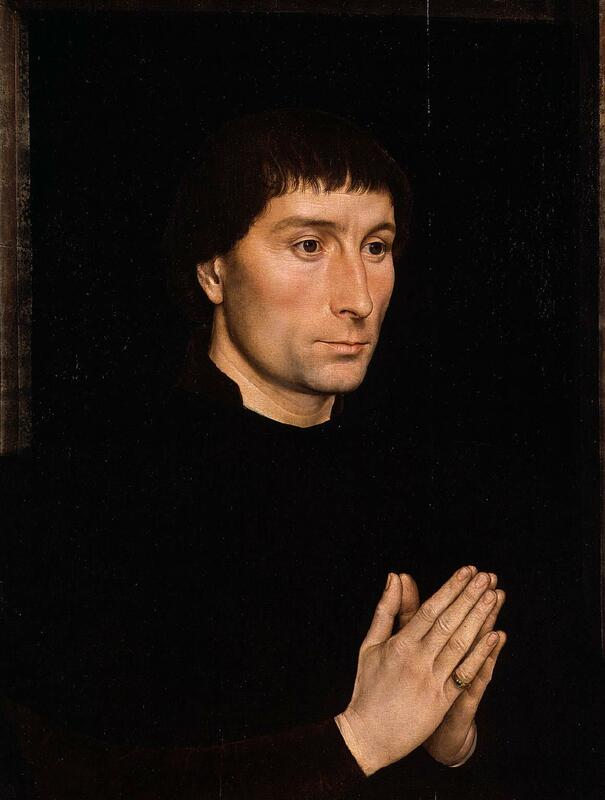 | James E. Snyder © Encyclopædia Britannica, Inc.
Uno degli esponenti di spicco della scuola di Bruges alla fine del XV secolo, Hans Memling dipinse numerosi e famosi pezzi religiosi. Anche se non ha avuto molta fortuna storica o tra i critici di oggi, al suo tempo fu un artista molto richiesto. Nato a Selingenstadt, in Germania, studiò a Colonia e poi nei Paesi Bassi. 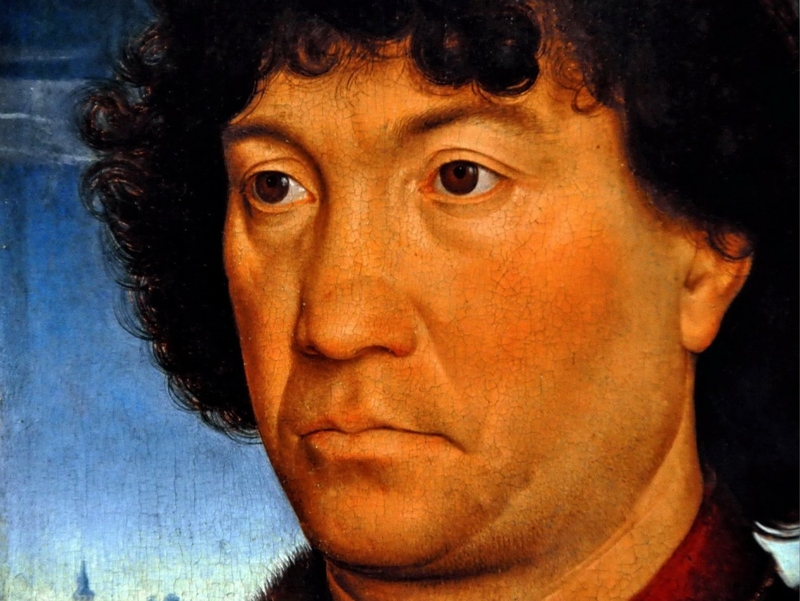 Il suo lavorò portò avanti lo stile olandese dei maestri, come il suo insegnante Rogier van der Weyden (1399-1464), e Jan van Eyck (1385-1441). 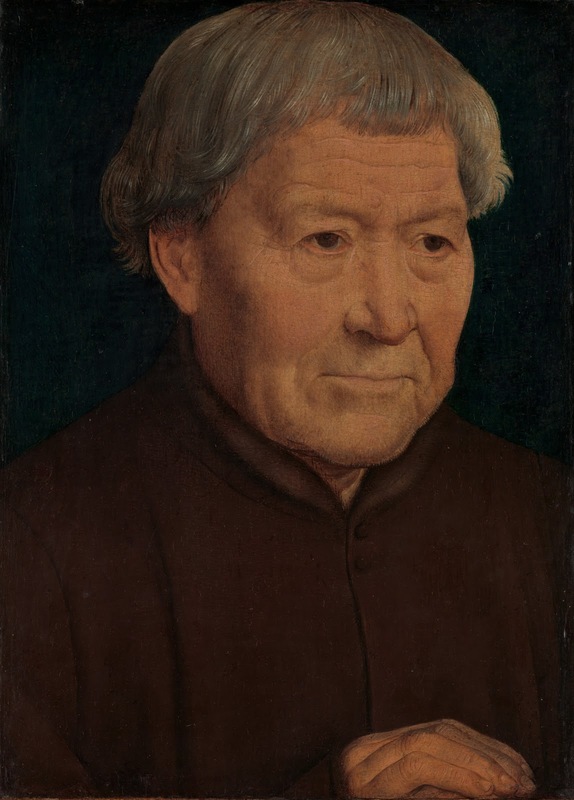 La sua opera fu molto influenzata dalla pittura fiamminga di artisti come Dieric Bouts the Elder (1415-1475) e Hugo van der Goes (1436-1482). 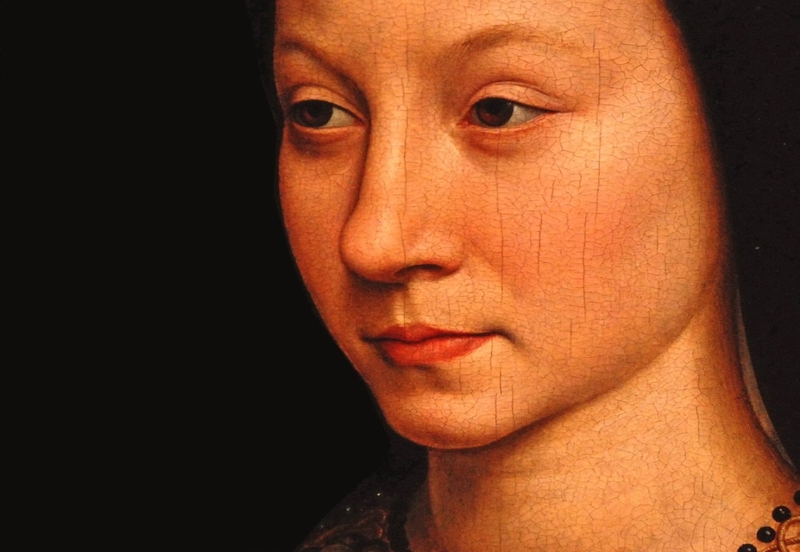 Da Weyden ricevette un'influenza manifesta nelle raffigurazioni concettuali ed espressive delle sue opere religiose. Un'opera che può essere considerata il suo capolavoro è il trittico del Giudizio universale, realizzato per l'imponente chiesa di mattoni della basilica dell'Assunzione della Beata Vergine Maria a Danzica. Il pannello centrale è una rappresentazione epica di Gesù e dell'arcangelo Gabriele che decidono il destino delle anime; quello sinistro è affollato da quelle condannate alla buca fiammeggiante dell'inferno; quello destro raffigura san Pietro e l'ingresso del paradiso. Altri trittici più sottili, ma comunque magistrali, sono il Trittico Donne e l'Adorazione dei Magi. Tra i suoi committenti figurano l'Ospedale di San Giovanni di Bruges, ricchi mercanti e borghesi, e agenti della famiglia Medici. 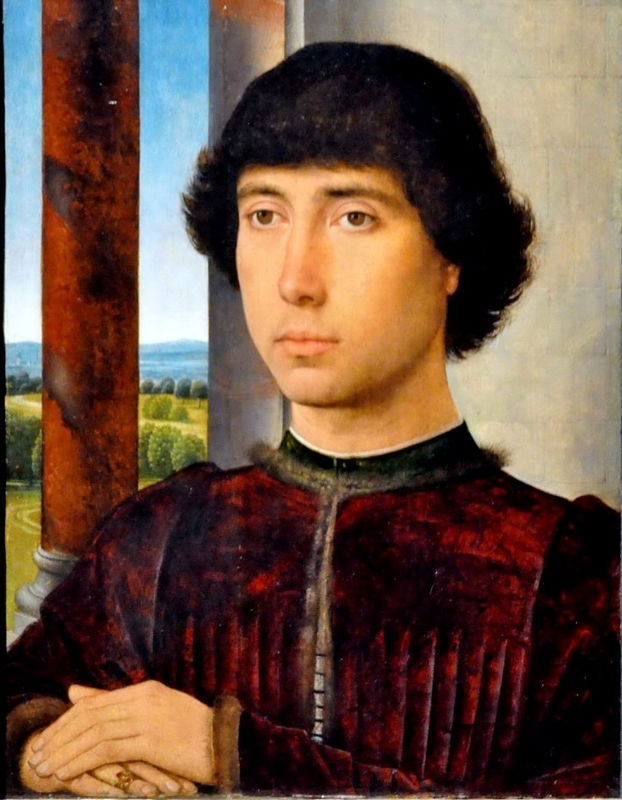 Tra questi ultimi, Tommaso Portinari gli commissionò un'importante pala d'altare, e numerosi ritratti, uno dei quali si trova agli Uffizi. La pala mostra scene dalla Passione di Cristo, con uno sguardo ampio, quasi a volo d'uccello, su Gerusalemme, con Cristo al centro e molte scene con le attività cittadine. Alla Galleria degli Uffizi troviamo la Madonna col Bambino e angeli, San Benedetto, dall'ospedale di Santa Maria Nuova, il suo grazioso Mater dolorosa e altri ritratti.